(Nanowerk News) Purdue researchers have observed a way that the brittle nature of ceramics can be overcome as they sustain heavy loads, leading to more resilient structures such as aircraft engine blade coatings and dental implants. These issues are particularly problematic for ceramic coatings of metal engine blades intended to protect metal cores from a range of operational temperatures. 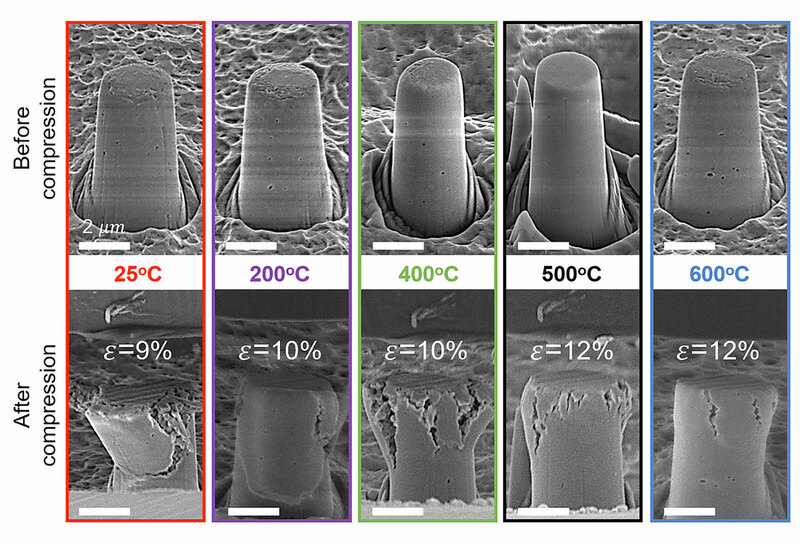 A study published in Nature Communications ("High temperature deformability of ductile flash-sintered ceramics via in-situ compression") demonstrates for the first time that applying an electric field to the formation of yttria-stabilized zirconia (YSZ), a typical thermal barrier ceramic, makes the material almost as plastic, or easily reshaped, as metal at room temperature. Engineers could also see cracks sooner since they start to slowly form at a moderate temperature as opposed to higher temperatures, giving them time to rescue a structure. "In the past, when we applied a high load at lower temperatures, a large number of ceramics would fail catastrophically without warning," said Xinghang Zhang, professor of materials engineering. "Now we can see the cracks coming, but the material stays together; this is predictable failure and much safer for the usage of ceramics." Recent studies have shown that applying an electric field, or "flash," significantly accelerates the sintering process that forms YSZ and other ceramics, and at much lower furnace temperatures than conventional sintering. Flash-sintered ceramics also have very little porosity, which makes them more dense and therefore easier to deform. None have yet tested the ability of flash-sintered ceramics to change shape at room temperature or increasingly higher temperatures. "YSZ is a very typical thermal barrier coating - it basically protects a metal core from heat," said Haiyan Wang, Purdue's Basil S. Turner Professor of Engineering. "But it tends to suffer from a lot of fractures when an engine heats up and cools down due to residual stresses." What allows metals to be fracture-resistant and easy to change shape is the presence of "defects," or dislocations - extra planes of atoms that shuffle during deformation to make a material simply deform rather than break under a load. "These dislocations will move under compression or tension, such that the material doesn't fail," said Jaehun Cho, a graduate research assistant in materials engineering. Ceramics normally don't form dislocations unless deformed at very high temperatures. Flash-sintering them, however, introduces these dislocations and creates a smaller grain size in the resulting material. "Smaller grains, such as nanocrystalline grains, may slide as the ceramic material deforms, helping it to deform better," Wang said. Pre-existing dislocations and small grain sizes enabled a flash-sintered YSZ sample thinner than human hair to grow increasingly plastic between room temperature and 600 degrees Celsius when compressed, with cracks starting to slowly spread at 400 degrees as opposed to conventionally sintered YSZ that requires 800 degrees and higher to plastically deform. "Metals can be compressed to 10 or 20 percent strain, no problem, but ceramics often fracture into pieces if you compress them to less than 2-3 percent strain," Zhang said. "We show that flash-sintered ceramics can be compressed to 7-10 percent without catastrophic fracture." Even when the sample did begin to crack, the cracks formed very slowly and did not result in complete collapse as would typically happen with conventional ceramics. The next steps would be using these principles to design even more resilient ceramic materials. The researchers would not have been able to perform in-situ experiments of a micron-sized ceramic sample without an in-situ nanomechanical testing tool inside a high-resolution scanning electron microscope equipped with a focused iron beam tool at Purdue's Life Science Microscopy Center and an FEI Talos 200X electron microscope facility in Purdue's Materials Engineering facility. Both microscopes were provided by Purdue's Office of the Executive Vice President for Research and Partnerships and the Colleges of Engineering and Science. Purdue is expecting an even higher-resolution aberration-corrected microscope that the researchers will soon use for future nanomaterials research.